This week we had a truly amazing time with our friends from the organisation Reach Beyond UK. They came to visit [and serve at] our Centre for Refugee Women & Children in Lesvos, Greece, with a team of volunteers from churches in the UK. Together we discussed ideas on how to improve the safety and quality of life of refugee women in camp – specially with regards to feminine hygiene and personal care. The lack of functional and clean bathrooms in camp is a well known problem. The fact that there is no proper light and they are shared by men and women makes it very hard for refugee women to feel comfortable to walk alone to the bathroom during the night, if they have to. It is not safe. Just one of the many things that make it hard for refugee women to care for themselves in camp. Conversations on such personal issues are never easy. But at the comfort and safety of our Centre, and under the guidance of a female doctor, a group of female workers and volunteers was able to discuss the topic with the refugee women. They were able to hear from them, better understand their challenges, provide some guidance and even offer solution devices to be tested by the refugee women. It was indeed an amazing and very productive time. It is very interesting how sometimes some partnerships feel so right! 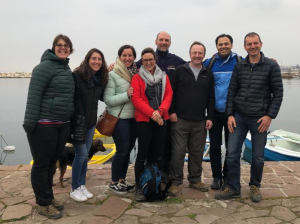 There was such similarity between our visions and philosophies of work, that we found ourselves already planning with the Reach Beyond team the next visit, as well as exploring with them additional ways in which we could partner to work together in Lesvos. We are looking forward to what the future has in store for us.